The oldest historical building of the capital is not carrying the name of Golestan which means "flower garden" by accident. Beyond the loaded flower beds, it can be named as the garden of arts. The finest Persian arts blend with 400 years of history, and unique architecture featuring the best of Persian designs and European influences. Built on the site of Tehran's citadel, the masterpiece that can be observed today is the result of centuries of construction and renovations. 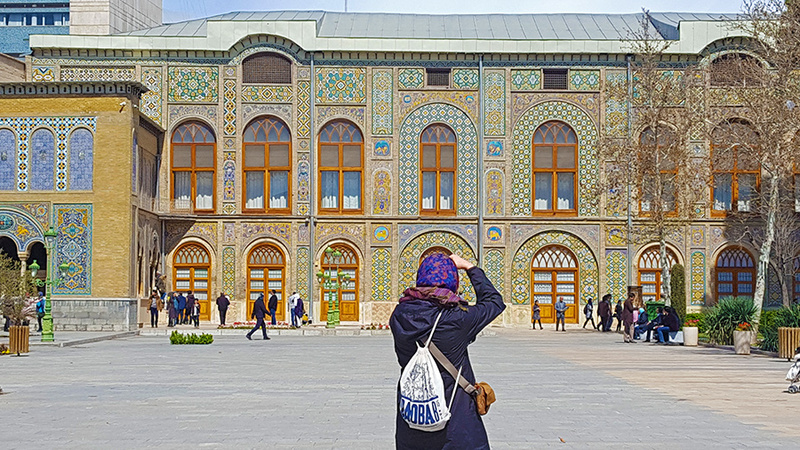 It's the Qajar kings who made Tehran their capital, who transformed this ensemble of palaces, royal buildings, and gardens as a complex of 17 historical buildings into an art piece. Entering the Garden Palace, the beautiful Marmar Garden unfolds itself under the visitor's eyes, a representation of heaven. A long pool runs on its center, leading the sight on the stunning terrace of the Marble Throne. Here, between walls covered with incredible mirrors work stands a majestic throne, sculpted with 65 pieces of marble. Until Reza Shah Pahlavi in 1925, Persian kings have come here to be solemnly invested with power, a jeweled crown placed upon their head. The Salam Hall, whose exteriors are as striking as its richly decorated interior is one of the most breathtaking monuments of this palace. More than 120 years ago, Naser al-Din Shah would hold official receptions here, while exhibiting all the gifts offered to the court. 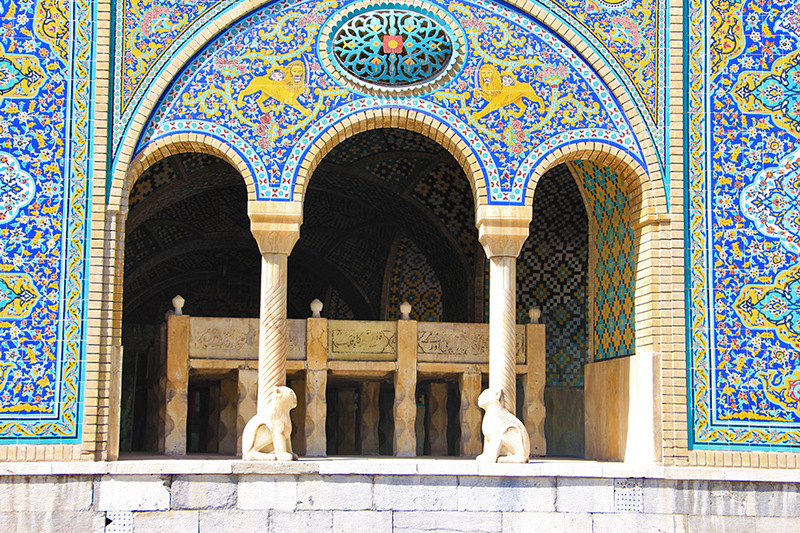 When he was not wearing its sovereign's outfit, the Qajar king enjoyed to rest in the quietness of "Khalvat- e Karim Khani "or the Karim Khani Nook, with its beautiful pond supplied by the underground water of the king's Qanat. Illuminated by the sun passing through its carved vaults, over one century later the place has kept its unparalleled atmosphere, where the grandeur marble tombstone of Nasser- al Din shah remains just in his favorite corner in peace. Naser al-Din Shah may have been the one who has left the biggest mark upon the place. The longest ruler of the Persian Empire was the first modern Iranian monarch formally visited Europe in 1873. When he came back, he wished to make its palace resemble the places which impressed him during his trip, mixed with the finest Iranian arts. Passionate about photography, he used to pose with his family and servants in front of the camera in the rooms of the palace. 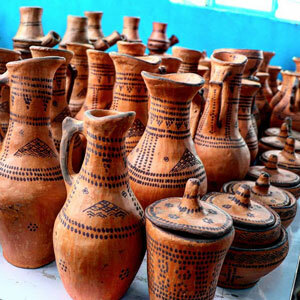 He also ordered the creation of a Photographic Archive, which can still be appreciated today and is a precious testimony of origins of modern artistic movement of Iran. Seized the imposing seat of "the highest building" of entire Iran from Ali Qapu edifice in Safavid capital city, Isfahan and stood as the first of its kind in the history of architecture of Iran in late 19th, Shams- Al Emarat or Shams- Ol Emareh in local dialect, is not a blend of modern European and traditional Persian masterwork to be admired, neither is the elevated mansion owns that favorable panoramic view of Tehran for Nasser- al Din shah and his family. 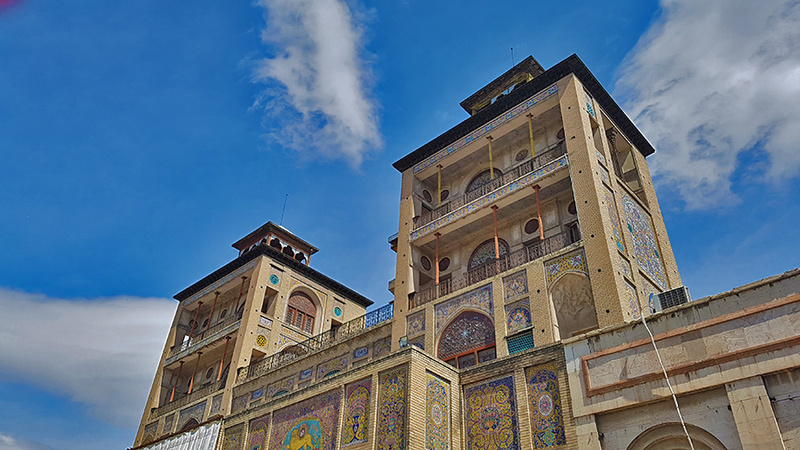 Whatever this sunny building used to be in the past has no chance to stand as gorgeous as the moment you walk in "Naser Khosro" street just a brick wall away of Golestan palace and get the dramatic look of it that makes your heart beat faster. 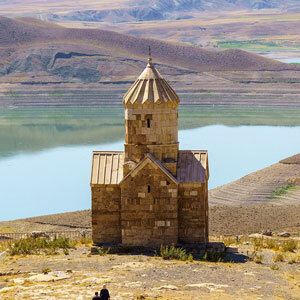 That is when you become to realize the essence of a desire for making Shams- Ol Emareh. 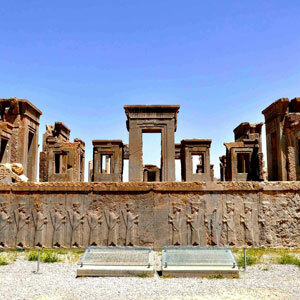 Since this charming palace was built and ordinary people could have prospect to see a landmark beyond the walls of palace, people has entitled aristocratic house or buildings as Shams- Ol Emareh. One can spend a lifetime seeking for the beauties enclosed in the Palace of flowers, admiring the colorful tile work, the finely sculpted stuccos, woodcarvings, shinning mirror ceilings, as well as the precious porcelains and gifts from Europe exhibited into buildings turned into museums or the portraits of kings in Negar Khaneh, boasting with splendid jewel and crowns that now being kept in National jewels museum of Tehran. 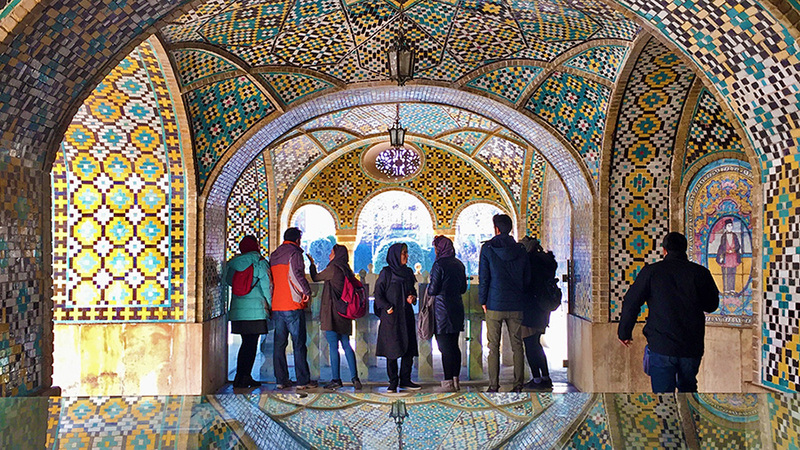 Nowadays, embellishing the green alleys of the garden, they remain the best spot for a memorable souvenir picture, for visitors coming from around the world to visit this dazzling member of Iran in the UNESCO world heritage list. Not so far from the gates of Golestan, in today's Arg square, once the prominent character of Qajar era in Tehran, had been the messenger of Nowruz. "Toop- e Morvarid" or the "pearl cannon" had turned from a devilish entity into a fine being by the culture of Tehrani people. 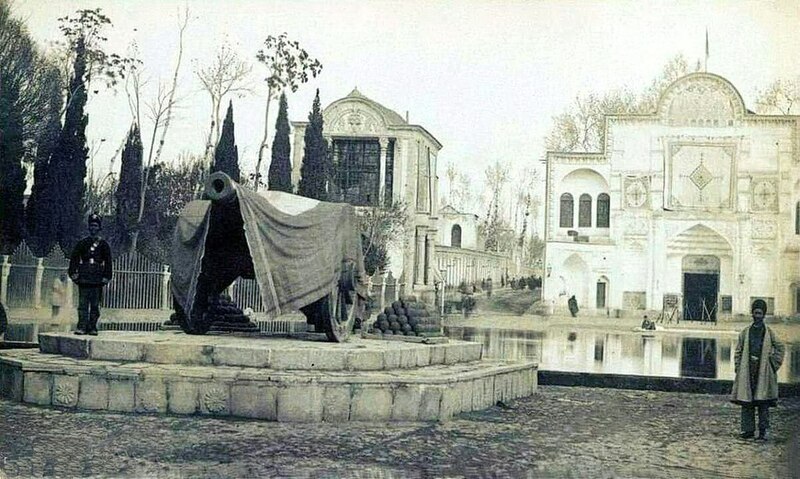 Right after the wars between Russia and Iran at time of the second Shah of Qajar monarchy, Fath- Ali Shah, a cannon had become the symbol of power of the King. Later on the residents of Tehran gave dignity to this cannon and named it "Pearl". Since then every year it was the cheerful call of pearl ordnance delivered the word of Nowruz, the Persian New Year. Not standing in the square in front of the palace any more, but still Iranians recall the arrival of the Nowruz with morvarid cry.